Luke Skywalker: The Hero Who Ran Away? So begins The Force Awakens. Hold on, though – shouldn’t Luke be fighting with Leia’s Resistance against the First Order, taking on the villainous Snoke and his fallen apprentice Kylo Ren, rather than running away from his problems? For many fans, to whom Luke was a childhood hero, this narrative choice seemed at best out-of-character, and at worst a betrayal of everything he stood for. Luke’s disappearance is indeed a long way from the swashbuckling young hero we saw in A New Hope and The Empire Strikes Back. But Luke’s journey in the original trilogy is to become a Jedi, the Jedi – the one to correct the mistakes of the previous generation. From this perspective, his choices following Return of the Jedi make perfect sense. To give that idea its proper context, we must understand why the old Jedi Order failed. These ideas are a fundamental part of the prequel trilogy, and have been further explored in The Clone Wars and Star Wars Rebels. When we first see the Jedi in The Phantom Menace, they are negotiating a trade dispute. It is not the role we might have imagined for them based on the original trilogy, and to make matters worse, Qui-Gon Jinn later states that freeing slaves is outside their remit. By tying themselves to the Republic, they are ordered around by politicians, unable to bring justice to those who need it if it is politically inconvenient to do so. The Order itself has also become bureaucratic, following its Code dogmatically with little room for flexibility or empathy. As the Clone Wars begin, the Jedi’s commitment to the Republic turns them into soldiers, and the act of fighting the war is itself enough to corrupt them. Before the war begins, Mace Windu (who symbolizes everything that is wrong with the Jedi Order) dismisses the possibility that Count Dooku could assassinate anyone because “he used to be a Jedi.” By the end of the war, in Christie Golden’s Dark Disciple, Windu himself argues for the assassination of Dooku. The Jedi have lost their principles. By the very act of fighting a war, Yoda seems to be saying, the Jedi fell into the dark side’s trap. When Ezra asks “how are we supposed to win if we don’t fight back?” Yoda replies “how Jedi choose to win, the question is.” In the same episode, Kanan Jarrus faces his final trial in a battle against a vision of a Temple Guard, and succeeds only when he casts aside his weapon and accepts that he cannot protect Ezra, and must let go. It’s a motif we will see repeated at very specific moments. When we meet Luke in ANH, he longs for adventure, even if it means joining the Imperial Academy. Once he leaves Tatooine, he becomes the swashbuckling young hero – saving Leia, swinging across chasms, shooting TIE fighters and, ultimately, flying an X-wing to destroy the Death Star. Yet in that final moment, we get our first hints of Luke’s future path, because he fires the final shot not by using his targeting computer or even his skill, but by “letting go” and becoming a vessel for the Force. The idea of allowing the Force to guide you, rather than wielding it for your own ends, is central to Jedi philosophy. In another moment of Jedi triumph in ANH, Obi-Wan becomes more powerful than Vader because he surrenders himself to the Force, rather than trying to defeat the Sith in combat. The Jedi’s true victory comes through non-violence. Yoda’s fears are verified when Luke fails his test in the cave. He ignores Yoda’s advice not to take his weapon, and from that moment he has failed. When he defeats the vision of Vader in combat, he finds his own face beneath the mask. Follow the path of fear and aggression, the film is saying, and Luke will end up like Vader. The lightsaber becomes an interesting symbol: as fans we might want Jedi to be “badass” and spend their time fighting, but as Kanan and Obi-Wan have shown, they only find true victory when they choose not to use their weapons. When Han and Leia are captured on Bespin, Luke – against Yoda’s warning that he is not ready – leaps into action to save them. When he faces Vader, he is the aggressor, drawing his lightsaber first. Luke fails catastrophically, losing both his weapon and his hand, and his friends end up having to save him. Trying to be a hero, taking the fight to the bad guy, has been a disaster. We must note that in RotJ, even an enlightened Obi-Wan still thinks Luke may have to destroy Vader. Yoda is vaguer, merely saying that Luke must “confront” his father. Luke signals his intent to save his father rather than try to kill him, and his moments of weakness in the final battle aboard the Death Star come when he is aggressive – he tries to strike down the Emperor after being goaded that his friends may die, and launches into his rage against Vader when he fears the Sith may turn his sister to the dark side. The desire to fight, even in order to protect your friends – as Ezra wished to do in Rebels – is a dangerous path for one with so much power. Luke’s moment of victory, and arguably the defining moment in all of Star Wars, is when he refuses to strike down his father, turns off his lightsaber and throws it away. Luke’s choice not to kill, not to fight, is what ultimately brings down the Sith. This is what makes Star Wars, and Luke Skywalker as a protagonist, so unique in modern cinema. Unlike the standard hero in a blockbuster adventure story, he wins not by finding the courage to fight, but by finding the courage not to fight. The Luke we leave at the end of RotJ is not the boy we met in ANH. He is no longer a teenager with a burning desire to take on the bad guys and save the galaxy, but a mature Jedi Knight, at peace with himself and with the Force. It is this Luke Skywalker that the sequel trilogy is taking its lead from. At New York Comic Con in 2015, discussing his work on Shattered Empire, Greg Rucka said he wanted to bring some of Qui-Gon to the character of Luke, and characterize him as always calm and at peace. 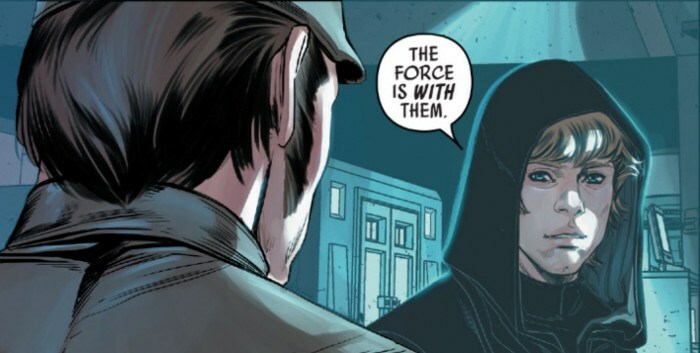 This is consistent with Luke’s arc, and in the comic he carries himself and speaks like a seasoned Jedi, talking of letting the Force guide him. And it is important that Luke’s mission here is not for the Rebellion; it is a quest to save the remains of the tree that grew in the Jedi Temple. Already Luke is separating himself from the goals of the Rebel Alliance, and following his own path. Luke has not yet appeared in Chuck Wendig’s Aftermath series, but this in itself is telling. The war against the Empire continues, but there is no hint that Luke is a part of it. Perhaps he is already trying to correct the mistakes of the old Jedi Order by not fighting a war for a political body, the New Republic. It may be that Luke swoops in to give the Empire its final defeat at Jakku in Empire’s End … but that seems unlikely. The databank on the official website says that following Endor, Luke committed himself to seeking out old Jedi lore and pondering how best to rebuild the Order. None of this is, of course, any criticism of Leia’s willingness to fight, or the just causes of the Rebellion, New Republic or Resistance. Their stand against tyranny and oppression, even if that means going to war, is presented in a positive light. But Star Wars also tells us that the Jedi, with all their power, must find another way if they are to avoid the corrupting influence of the dark side. When we reach Claudia Gray’s Bloodline, six years before TFA, Luke’s new Jedi Order is still a mystery. They have no connection to the New Republic, to the point that some senators are suspicious about what exactly Luke is doing. What is fascinating is that even though Luke corrected many of the old Jedi’s mistakes, he still failed. Ben fell to the dark side, and his Order was destroyed. The TFA novelization indicates that Kylo wants to bring order to a chaotic galaxy, as Vader did, so we might imagine that Ben was frustrated by Luke’s unwillingness to truly wield Jedi power. However, since none of Kylo’s philosophical musings are to be found in the film itself, it is difficult to know how much of this provides real insight into his character. For now, the reason for Luke’s failure remains a mystery. Han believes that Luke “felt responsible” for Ben’s fall and “walked away from everything.” However, the fact that Luke has gone looking for the first Jedi Temple implies the opposite. His attempt to rebuild the Jedi has failed, so he has returned to their origins to find answers. Instead of joining Leia’s war – which, history tells him, is exactly the wrong thing to do – he has followed the path of the Force. He understands that the great battle between the light and dark sides cannot be won by fighting. He must find another way. The Force’s call sends Rey to him, and it may be that a new apprentice is the very thing Luke needs. Rebels introduces the concept that a Master and an apprentice need to enter certain temples together. Luke may have been unable to progress further until Rey turned up. Rey possessing Luke’s old lightsaber is itself an interesting symbol: Jedi victories come when they cast aside their weapons, after all. Rey has shown that she is susceptible to fighting from a place of rage in her duel against Kylo, and no one is immune to the dark side’s call. Perhaps the sight of this weapon, which symbolizes his failures on Dagobah and Cloud City, explains Luke’s conflicted look when he first sees Rey. Rey’s mission is to bring Luke back to help the Resistance, but Luke may be reluctant to do this. I suspect he will encourage Rey to follow the path of the Force with him instead, and help him find answers. This may be a challenge for Rey, who will want to return to help her friends, but it is a trial she will have to pass if her destiny is indeed to be a Jedi. We may learn that something else happened to Luke that further explains his exile. Even without this, however, his search for a Jedi Temple as an alternative to fighting in the Resistance is entirely consistent with his character as developed through the original trilogy. I would have been disappointed if he had chosen any other path. Fantastic piece. Very insightful, and it feels on the mark with where they are trying to go with the Jedi in this story. As a fan though, I want some badass green lightsaber action from Luke. Can we have both? This is a really good review of the path of the Jedi throughout the entire series. Well done! I would add one point that I find puzzling, though. You outline very well how Luke learns from the failures of the Old Jedi, and from his own personal failures, that meeting violence with even greater violence is not the way of the Jedi. It makes sense, then, that in rebuilding the new Jedi Luke would be hesitant to jump right in to the continuing political struggles across the galaxy. I would note that by the time of Bloodlines, the galaxy is mostly at peace, so there is still a question of why the Jedi haven’t emerged at that point (why can’t Leia take a Jedi with her when she travels to Ryloth or Bastatha on a peaceful fact-finding mission? ), but maybe Luke doesn’t think his embryonic Jedi Order is ready for that level of exposure yet. However, I think that Luke’s story indicates that one of the other big failures of the Old Jedi is their emotional distance from the rest of the galaxy, and from one another. Of course, anger and hate are still problems for the Jedi, but their solution to avoid these harmful emotions by avoiding any emotional attachment is generally portrayed as a bad thing (Anakin’s possessiveness about his family is driven at least in part by the secrecy that surrounds them, which prevents him from seeking reasonable guidance on how to balance his vocation as a Jedi with his commitment to his family from the people who should be helping him navigate that sort of thing). In fact, by Episode VI we see that emotional attachment is actually what defeats the Sith – Luke clearly draws strength from finding his sister and having a new family (even if the fear of losing her causes some tension), and the mutual love of father and son is what destroys Vader and allows Anakin to reemerge. Given how important being emotionally-grounded is to the outcome of the Original Trilogy, it seems odd to me that Luke’s New Jedi should bee so isolated from the rest of the galaxy. It seems like a big part of what drives Kylo’s emotional problems is that, in order to become a Jedi, Luke took him away from his parents! Why would Luke Skywalker, who spent his whole life yearning for parents, only to discover that his bond with his long-lost father was essential to defeating the Dark Side, why would he found his new Jedi Order on the basis of emotional (and physical) detachment from loved ones? Similarly, why would that Luke Skywalker go looking for the original Jedi Temple *by himself,* cutting off all ties (even with R2-D2)? I can respect the idea that Luke wants to avoid direct participation in large-scale violence, given his beliefs. However, it seems as though the Sequel-era material will feature a Luke who is as emotionally-stunted as his Old Jedi predecessors. This is a disappointing choice, I think. Thanks! You raise some really interesting points. The attachment issue is something I avoided discussing in this piece, mainly because we don’t really know how Luke feels about it. In TFA, Leia regrets sending Ben away, but we don’t get the story from either Ben or Luke’s point of view. I hope Episode VIII will answer a lot of our questions about why exactly Ben fell, and where Luke went wrong. But in terms of Luke’s story, this is how I see it: I don’t think it was attachment that defeated the Sith. Instead I think it was the purest form of compassion – the willingness to sacrifice your life for someone else. That’s the opposite of attachment, because there’s nothing selfish about it. Luke is willing to sacrifice his life in an attempt to bring his father back, and Vader sacrifices his life to save his son. It comes from a place of emotional love, but it’s a selfless, healthy love. The danger is selfish love, which is what Anakin was never able to overcome – he said he “couldn’t live without” Padme, he wanted to control her fate, and became enraged when she turned against him. It led him down a very dark path. And remember that Luke almost turned to the dark side out of a furious need to protect his sister from the Sith. So I think the Jedi were right in their caution about attachment, but they dealt with it poorly. They were too obsessed with their Code, and didn’t show enough compassion or empathy to really help Anakin to let go. They didn’t understand that those kinds of relationships can also be a strength. If I were to speculate on Luke’s Jedi, I’d say he was more flexible about relationships, even romantic relationships … but ultimately knowing that you have to be able to let go of those close to you, because when you have so much natural power, the desire to keep your loved ones in your life can lead to some dark places. As with everything else in Star Wars, it’s all about balance. Fair points, and I agree about the important difference between selfless and selfish love in Star Wars. The thing is, as you rightly point out, that the Old Jedi fear selfish attachment so much that they try to shut down any sort of emotional connection, even relatively healthy ones. Anakin’s emotional obsessiveness is obviously not entirely the fault of the Jedi given the trauma of his early life, but he is a troubled kid who gets absolutely no help from his mentors and peers when it comes to navigating how to love someone without becoming dangerously obsessive. When he faces difficult choices about his feelings, all he gets is scolded about how his feelings are bad and he is flawed for feeling them. The Jedi teach him to fear his feelings, and so he represses them and hides them until they destroy him (and everyone he cares about). Set against this context, I think that Luke’s journey in the OT is largely about finding a more emotionally mature way to deal with one’s family, without total obsession but also without total detachment. For most of the OT, we see Vader’s relationship with his family as selfish and instrumental. When Vader finds out he has a son, he tries to use him as a tool to destroy the Emperor and gain more power. When Vader finds out that he has a daughter, his first reaction is to use that information as leverage to gain tactical advantage over Luke in a fight; his ploy backfires, but this shows the depth of Vader’s Sith-iness, in which emotional relations are simply one more tool for gaining power or advantage. In the end, Luke rejects this selfish paradigm, refusing to kill Vader or fight the Emperor, despite the threat they pose to his sister. I suppose from one point of view, this would validate the Jedi ideal of emotional detachment, though I think it is debatable whether what is happening here is Luke becoming less attached to his sister, or simply refusing the false ultimatum that he must destroy himself to save her. After all, at the climax of RotJ, when Luke is being tortured to death by the Emperor, he does not calmly ask Anakin to assist him as a fellow well-wisher of compassion to all living things. He cries out, “Father, help me!” That specific, familial connection that was so destructive in the Prequels becomes redemptive when put into its proper context by Luke’s refusal to allow his love for family to become a source of anxiety, rather than strength. I think we can assume that Vader had watched the Emperor kill plenty of people in his time (he certainly watches Alderaan get destroyed without complaint), but watching the Emperor kill his son, who moments earlier had refused to kill Vader, was a step too far. The point here is that attachment to a son, not just general compassion, is what ultimately pulls Anakin back to the Light. Although this is a direct repudiation of the Sith, I also think it is a repudiation of the Old Jedi. Compassion, especially specific compassion for family, in its proper context is actually a very good thing, even for a Jedi. P.S. – Thanks again for a great post! Excellent piece! Totally agree with the analysis on how Luke through his path learned the ways of the Force and all the connections with Rebels. One of the things I would love – in case they decide to have Ahsoka survive Malachor – is for her to remain until after ROTJ so that would be great to have her meet Luke and she could guide him into learning more about the reasons why the Jedi fell.